ABOUT PRODUCT Professional sound evenif you're not a pro. 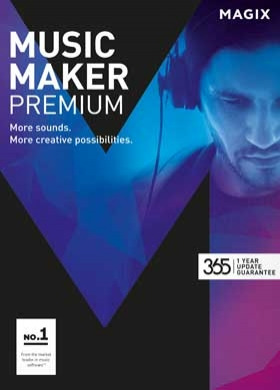 MAGIX Music Maker Premium includes a new VST3 interface,6,500 sounds & loops, a free app and 17 virtual instruments such as a Choir, Concert Guitar and SoundtrackPercussion. Drag & drop loops, sounds & samples to easily create new arrangements and play virtual instrumentsusing the onscreen keyboard. The touchoptimizedscreen keyboard now fe… atures a new mode with 7 musical scaleswhich only plays notes that match the song you are working on. The program's effects and mastering area has beencompletely redesigned, and the new integrated Élastique Pro algorithm from zplane is one of the world's bestalgorithms for adjusting pitch and tempo.. 1 YEAR UPDATE GUARANTEE* Unlimited use of program Always get the latest version at time of purchase Plus: all new features for free for 1 yearFEATURES 6,500 new sounds & loops: From 10 popular genres Premium Soundpools: Chart Hits, Movie Score, Trap, Metal Soundtrack Percussion: Create a blockbuster effect with the rhythm section Concert Guitar: With a gorgeous acoustic sound 4 new virtual instruments: Choir, Cinematic Synth, Accordion, Folk Free app: Operate Music Maker using MAGIX Audio Remote Newly designed effects: Touchoptimized and even easier to use Mastering Suite: Completely redesigned for even faster workflows and better sound quality	TECHNICAL DATA For Microsoft Windows 7 / 8 / 10	All MAGIX programs are developed with userfriendlinessin mind so that all the basic features run smoothly and canbe fully controlled, even on lowperformancecomputers. The technical data for your computer can be found in thecontrol panel of your operating system. Processor: 2 GHz RAM: 2 GB Hard drive space: 9 GB for program installation Graphics card: Onboard, 1280 x 768 resolution Sound card: Onboard	Internet connection: Required for registering and validating the program, as well as for some program functions.Program requires onetimeregistration. Supported import formats: Disc: Audio CD Audio: WAV, MP3, OGG Vorbis, WMA, QuickTime, MIDI, FLAC Image: BMP, JPG Video: AVI, MXV, WMV	Supported export formats: Disc: Audio CD Audio: WAV, MP3, OGG Vorbis, WMA, QuickTime, MIDI, FLAC Image: BMP, JPG Video: AVI, MXV, WMV *Note:With the update guarantee you will receive a full year of free new features and updates, which can be used indefinitely.If you reinstall the program after one year, you will have access to the basic version. After the oneyearupdateguarantee has expired you can extend it for a discounted price.